Meyer could bring crystal paperweights back to C-bus. 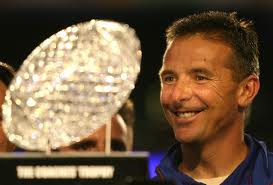 If the gossip coming out of Columbus is true, then Urban Meyer may be the next head coach of Ohio State. Meyer's "I've certainly not accepted any job" dissembling during yesterday's Michigan-Nebraska telecast was just not very convincing. The man's as good as signed, even with the NCAA infractions committee ruling still hanging over Columbus. Bringing in Meyer would seem to be a departure for the program, as Buckeyes football has never been about plucking the shiniest coaching bauble off the shelf. Even Woody Hayes himself came from humble Miami University. John Cooper did take Arizona State to three consecutive bowl games, including an in hindsight ironic Rose Bowl victory over Michigan, but he never reached the airy heights of the former University of Florida coach. Meyer has won 104 games and two national championships over 10 years with the Gators, Utah and Bowling Green. Gaudy numbers indeed, although ones that come tinged with the mercenary vibe reflective of many successful modern college football coaches. Three teams in a decade give one the feeling that Meyer is always looking ahead to the next gig. Illness likely exacerbated by the stressful demands of the job led to Meyer's "retirement" from the coaching ranks last year. Accepting the Buckeyes' job so soon after his Florida leave-taking could raise more red flags among Ohio State fans wondering about their new honcho's long term plans. While it's true Meyer has done some bed-hopping, at Florida he jumped to dispel rumors of his taking the headset at Notre Dame, a position he once described as his "dream job." In an interview with the Gainesville Sun in summer 2009, he cemented his fealty to Gators football, saying "I'm not going to Notre Dame, ever." Now, this interview was conducted 18 months before his self-imposed ouster from Florida. Maybe Meyer even then had some inkling that his health would not allow him to stay on the sidelines for much longer, making the Notre Dame job untenable. Still, it's not like he Saban-ed his way out of Florida by saying one thing and doing the exact opposite. Nor is it as if his connection to Ohio football is nonexistent. On the contrary, he's an Ohio native, a University of Cincinnati alumnus and former graduate assistant coach with the Buckeyes. Those ties at least give some indication that Meyer would be in it for the long haul, health permitting. There is also speculation that he would add two more Ohio natives, including former Buckeyes QB and fellow ESPN analyst Kirk Herbstreit, as members of his coaching staff. And really, how long would be long enough for Buckeyes fans? Any one of us would take the two titles he won in six years at Florida. Meyer's version of the spread offense would also help quarterback Braxton Miller. The young signal-caller has shown improved playmaking ability as the season has progressed, but still has the prototypical inexperienced athletic quarterback tendency to tuck and run. Part of that is game-planning, but having an established offensive presence giving him the plays may unleash Miller's true kung fu as he enters his sophomore season. Luke Fickell did what he could during this chaotic season. But the current 6-5 record, with a very real possibility of going 6-6 after next weekend's tilt in Ann Arbor, just isn't good enough in Buckeye land, no matter what the circumstances. Unfair, perhaps, but Ohio State is a prestige program and Fickell has looked utterly flummoxed too many times during the year. A win at the Poulan WeedEater Bowl, or wherever the Buckeyes end up, should not serve as a saving grace. Call it the arrogance that leads to so much derision from fans outside the state, but bringing in a big gun like Meyer is the only option. Boil down all the tangential stuff surrounding his career and you'll come to the very simple conclusion that the man is a winner. That's all that should count in Columbus.